In a week, it could all be different. Your financial life, how you deal with money, your ability to increase your earning potential and finally getting started with investing because you know just HOW to. 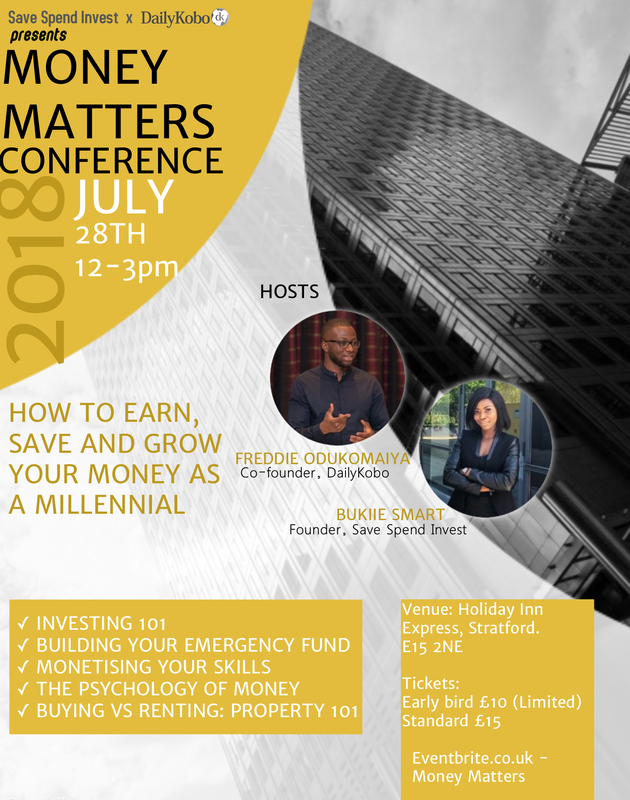 This and much more including buying a property and saving for an emergency fund will be talked about at the Money Matters Conference happening NEXT WEEK SATURDAY, JULY 28TH, 2018. This 3 hour intensive workshop and seminar happening in London will have you feeling confident about how to earn, save and grow your money for the rest of the year. In our last conference, attendees gained first hand knowledge of dealing with debt and improving their saving habits, so this time we’re taking things up a notch so you can learn how to start investing, making money from your skills and much more. Have you got your tickets yet?! Grab a friend and get the last few remaining! Click here to purchase your one way ticket to financial freedom. Can’t make it? Pay it forward by sharing with a friend who can!